An agent from the Bureau of Alcohol, Tobacco and Firearms trains a sniffer dog at its facility in Front Royal, Va. The "business card" for bomb-sniffing dog Able. The good dogs stopped and sat by the containers with the explosive traces, and were rewarded with a handful of treats. Goodlatte was here to promote the center and to "put on the record" that the facility should remain in his district. The dogs are all Labrador retrievers. ATF trainer Shawn Crawford explained the facility gets "the dogs who don't make it as a guide dog. They're usually too high energy," he said. "There's nothing wrong with them; we just say they're making a career change." They come to the center when they're around 14 months old, and include both males and females. Their "breed history," Crawford said, makes them ideal for the ATF's purposes. "They're hunting dogs," Crawford said, "so if I have a gun in a school or an explosive device in a school, why not use a hunting dog to hunt for explosives." The dogs trained here have had some high profile assignments lately. They were deployed after the Parkland, Fla., school shooting in February to search for possible bombs and spent ammunition. In March, they were used during the Austin bombings. 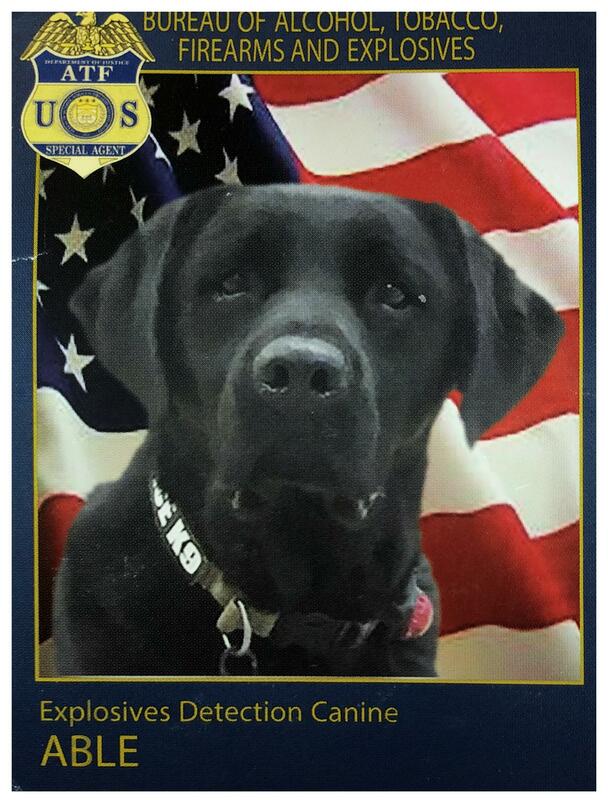 ATF spokesman Cody Monday said aside from their sniffing abilities, labs are used for another reason. "They wont bite you," Monday said, "they'll lick you to death. ... You can take them just about anywhere." The biggest qualification for the dogs is that they like food, which may explain why few of them fail their training. The ATF has trained more than 1,100 dogs here for fire departments domestically and around the world and thousands more for the military. The chairman of the Senate Appropriations Committee, Sen. Richard Richard Shelby of Alabama, has shown interest in moving the center to his state. It's an idea that Goodlatte believes makes no sense, but needs to be taken seriously. "The fact that the request was made," Goodlatte said, "and the fact that it seems to be an ongoing interest, caused us to want to put on the record all the reasons why this is a great facility here — and why it would not be a good idea to move this facility to a place where they'd basically have to start from scratch." Shelby has suggested moving the training facility to the Redstone Arsenal, near Huntsville Ala., where bombs have been tested and manufactured since World War II. But, Goodlatte said, you just "can't train a bomb sniffing dog at a place where everything smells like a bomb." 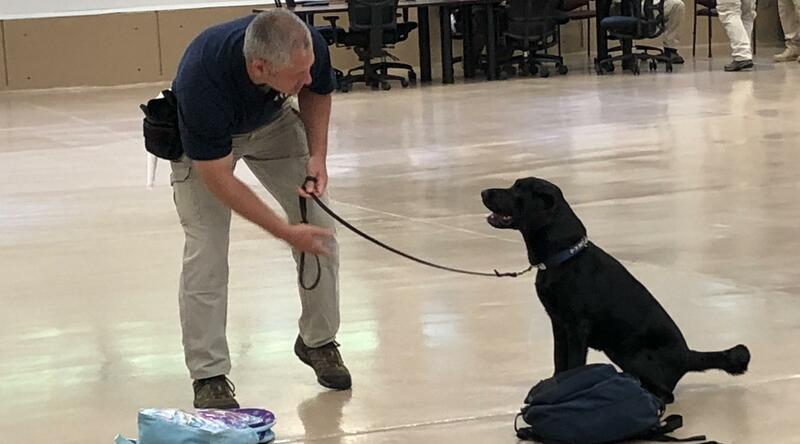 A spokesperson in Shelby's office said the senator now isn't "actively pursuing" moving the dog training center, but wants to make sure it is "spending taxpayer dollars wisely." A study conducted by the ATF concluded it would cost $40 million in taxpayer money to move the facility from Virginia to Alabama. And while it's unclear how the dogs would react, it's a fair bet the people of this corner of Virginia would be howling in protest if the move were to take place. In the foothills of the Blue Ridge Mountains, the Bureau of Alcohol, Tobacco, and Firearms runs an academy for dogs. They're trained to detect explosives and chemical accelerants used in arson cases. A powerful senator wants the facility moved to his state, and a powerful congressman is fighting back.  NPR's Brian Naylor reports on a dog-eat-dog battle in Virginia. UNIDENTIFIED PERSON: Good dog. Good dog. BRIAN NAYLOR, BYLINE: A half-dozen dogs are demonstrating their training at the ATF's Canine Training Center. They run around a large gymnasium-like room. On the floor are metal cans and suitcases, some of them with traces of explosives. But good dogs stop and sit by the containers with the explosive traces and are rewarded with a handful of treats. SHAWN CRAWFORD: We get the dogs that don't make it as a guide dog. They're usually too high energy. There's nothing wrong with them. We just say they're making a career change. NAYLOR: Shawn Crawford is a trainer with the ATF. He says the dogs are all one breed - Labrador retrievers. CRAWFORD: We get them when they're about 14 months old - male, female. If we look at breed history, they're hunting dogs. So if I have a gun in a school or an explosive device in a school, it's in a locker, the dog's hunting with its nose to find that odor. So why not use a hunting dog to hunt for explosives? NAYLOR: The dogs trained here have had some high-profile assignments lately. They were deployed after the Parkland School shooting last February to search for possible bombs and spent ammunition. In March, they were used during the Austin bombings. The ATF's Cody Monday says, aside from their sniffing abilities, Labs are used for another reason. CODY MONDAY: They won't bite you. They'll lick you to death. And that's one of the reasons that we like Labradors is they're friendly, you can take them just about anywhere, and you don't have to worry about anything like that. NAYLOR: The biggest qualification for the dogs is that they like food, which may explain why few of them fail their training. The ATF has trained more than 1,100 dogs here for its use and thousands more for the military. House Judiciary Committee Chairman Bob Goodlatte, a Republican, represents the district here and is proud of the facility but is worried about its future. That's because the chairman of the Senate Appropriations Committee, Richard Shelby of Alabama, also a Republican, has shown interest in moving it to his state. It's an idea Goodlatte says makes no sense but needs to be taken seriously. BOB GOODLATTE: The fact that the request was made and the fact that it seems to be an ongoing interest caused us to want to put on the record all the reasons why this is a great facility here and why it would not be a good idea to spend $40 billion or more to move this facility to a place where they'd basically have to start from scratch. NAYLOR: Shelby has suggested moving the dog-training facility to the Redstone Arsenal where bombs have been tested and manufactured since World War II. But Goodlatte says you just can't train a bomb-sniffing dog at a place where everything smells like a bomb. Shelby's office says the senator is not actively pursuing moving the dog-training center but wants to make sure it's spending taxpayer dollars wisely. A study conducted by the ATF concluded it would cost 40 million of those taxpayer dollars to move the facility from Virginia to Alabama. And while it's unclear how the dogs would react, people in Virginia would be howling in protest. Brian Naylor, NPR News. Transcript provided by NPR, Copyright NPR.